Residents of the besieged Syrian city of Aleppo rushed for long-awaited supplies of food and essentials on Friday, as the Russian military opened three humanitarian corridors for civilians and militants who had agreed to lay down their arms. However the governor of Aleppo province Mohammad Marwan Olabi has told the SANA news agency that militants are blocking several dozen families from leaving the eastern areas of the city. Three passages for people to move from the besieged part of the city to safe areas opened on Thursday. 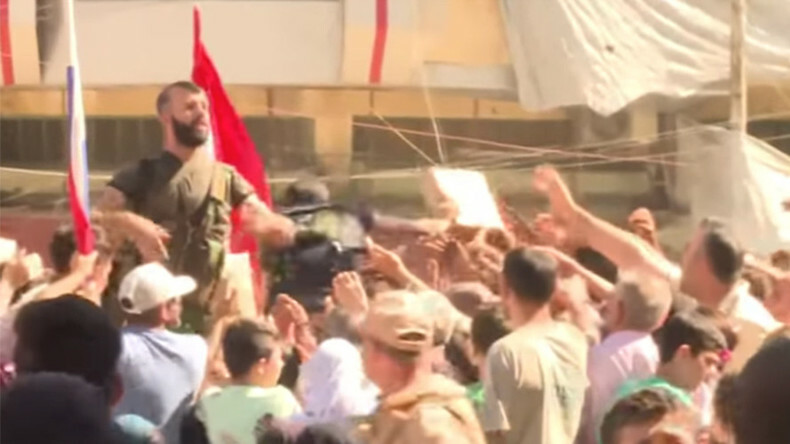 Local residents have confirmed that it is the rebels that prevent civilians from leaving the city, despite the Syrian government’s efforts to help them do so. “The government gave the opportunity for civilians to come here, but the rebels are not letting them; they are shooting at them. This is not acceptable. The rebels should let the civilians come here to avoid bloodshed. Those are our relatives, our people. If the civilians come here we can save the babies and the women. If the rebels want to fight they can fight, why include the civilians?” one Aleppo resident told Ruptly. “Even though the president established those corridors, the rebels won’t let the civilians to go out,” another resident said. The Russian reconciliation center in Syria has set up at least three checkpoints for humanitarian corridors. Syrian helicopters have been distributing leaflets which stated where exactly the local residents can get humanitarian help. Apart from food, Aleppo residents are also receiving personal hygiene products and essentials. According to Kirill Savin from the Russian center for reconciliation, up to 250,000 civilians may pass through these humanitarian corridors. Russia is also delivering huge amounts of flour, grains, sugar and other essentials to the people of Aleppo. "This corridor will be operating only in daylight hours. In this district there will be buses, while at the moment the meal and medical station are being rolled out. There will be everything necessary for people to leave safely and to move to the places of temporary accommodation,” he added. One resident said that her house was completely destroyed because her family supported Syrian government. “They targeted our balcony because there was a picture of our President [Bashar Assad]. We had everything [under Assad rule] – safety, stability,” she told Russian military. The UN Syria envoy Staffan de Mistura welcomed the humanitarian operation in Aleppo, and suggested leaving “the corridors, which are being established at their initiative” to UN. “My understanding is the Russians are open for major improvements," he said. "The UN and the humanitarian partners ... have experience. That's our job. Bringing humanitarian assistance and supplies to civilians, wherever the happen to be, is exactly why the UN is there." — UN Geneva (@UNGeneva) 29 июля 2016 г. The Red Cross on Thursday said that these humanitarian corridors must ensure the safety of the city residents. German Foreign Minister Frank-Walter Steinmeier generally welcomed Russia’s humanitarian aid to Syria, saying that Moscow bears responsibility for Syrian people in the conflict. Berlin has called for Moscow “to cooperate with the United Nations and with the international aid groups to improve humanitarian access for people in Aleppo,” he added. Following statements from De Mistura and the Red Cross, Russia's ambassador to the United Nations in Geneva Alexey Borodavkin said that Russia will “carefully study and take into account” suggestions made by UN Syria envoy. “We have ….noted the proposals which the UN Syria Special Envoy stated in his briefing….His proposals will be carefully studied and taken into account,” Borodavkin said, as cited by RIA Novosti. France, however, apparently failed to recognize the Russian humanitarian help to Aleppo. The country’s foreign ministry issued a statement, saying that the plan was not a “credible response” to Syrian crisis. "In this context, the idea of 'humanitarian corridors' consisting of asking Aleppo's residents to leave the city does not offer a credible response to the situation," the ministry said. “It has the risk, if it is a ruse, of completely breaking apart the level of cooperation,” he said, as quoted by Reuters. “On the other hand, if we’re able to work it out today and have a complete understanding of what is happening and then agreement on the way forward, it could actually open up some possibilities,” Kerry added. In the meantime, the US embassy in Syria has even suggested that Russia is using the humanitarian operation as a means to force the residents of Aleppo out of the city, thus abandoning it to government forces. Russia said it was surprised by the reaction “of some media and politicians that saw a hidden agenda in the Russia’s actions” in Aleppo. “The Aleppo operation is exclusively humanitarian, and we are ready to do anything possible to help peaceful civilians who are hostages of the terrorists, and even to those militants who wish to lay down arms,” the Russian Defense Ministry said in a statement on Friday. Despite the increasing number of settlements adhering to the Russia-US brokered ceasefire, which came into force on February 27, not all the groups claiming to belong to the “moderate” opposition are observing the truce. In June, militants from an Al-Qaeda-linked group, Jaysh Al-Islam, shelled a UN humanitarian convoy near Damascus, according to reports from the Russian Defense Ministry.